The Corinthians were founded in 1882 by N.L. "Pa" Jackson, Asst. Hon. Sec. of the Football Association. His aim was to develop a club side capable of challenging Scotland at international level. Within four years, calling on the best amateurs from the public schools and universities, there were nine Corinthians in the England team. 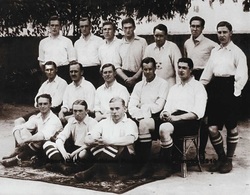 Twice, the national squad consisted entirely of Corinthian players. The Corinthians went on to challenge some of the top professional teams in the land including, in 1904, beating Manchester United 11 - 3, still their worst defeat. They also took football round the world, touring in South Africa, Canada, the United States, South America and across Europe, including Hungary, Czechoslovakia, France, Spain, Holland, Denmark and Germany. In 1910, after a visit to Sao Paulo in Brazil, the locals were so impressed they immediately founded a Corinthians of their own, Sport Club Corinthians Paulista, now one of the most successful clubs in South America who in 2012 beat Chelsea to become World Club Champions. Real Madrid, and some say the English National Team, play in white shirts in tribute to the Corinthians. 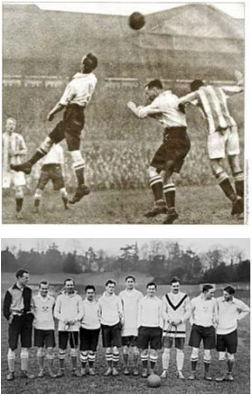 During the 1920's, in an attempt to revitalise interest in the club, Corinthian FC began to participate in the FA Cup. Their inaugural cup tie was away against Brighton and Hove Albion on January 13th, 1923 in a match that ended in a 1-1 draw. After another 1-1 draw in the replay at Crystal Palace, Corinth finally lost the second replay 1-0 at Stamford Bridge (left) on January 22nd, in front of a crowd of almost 45,000. Despite the defeat, the club's first foray into the FA Cup was still considered a great success and had certainly captured the imagination of the public, with almost 90,000 spectators attending the three games. The following year Corinthian went one better; defeating Blackburn Rovers in the 1st Round before bowing out to West Bromwich Albion. By the end of the 1930's, interest in amateur exhibition football was waning and it was ultimately decided that Corinthian should merge with The Casuals FC, a club with whom they had shared a great many players over the preceding decades. The two clubs had toured together as 'The Corinthians and Casuals' in 1937 and subsequently had both been run by a joint committee. Thus, on May 1st 1939 Corinthian Football Club amalgamated with The Casuals to form Corinthian-Casuals FC. To this day, the club still adheres to the founding principles of amateurism, fair-play, sportsmanship and the 'Corinthian Spirit'.